After Dot turned one, she starts to exercise her independence more as she grows. When she does not get things her way, she will whine and cry. Sometimes she will just swing her hands and knock off what is before her. Many times, I found myself fuming within when Dot made a mess, refused to obey my instructions, or simply made my life inconvenient. I remembered lashing out on her and and I did the most unthinkable thing of hitting her out of anger. Quickly I realised my mistake and tried to gain control of my emotions. I felt so lousy after that – I just felt like the worst mom in the world! When it comes to disciplining my child, I’m clueless and confused. I’m not sure whether what I administer or do is the best for her and myself. To spank or not to spank also raises a big question mark in my head. Out of goodwill, parents and friends give me their advice which sometimes left me even more confused. 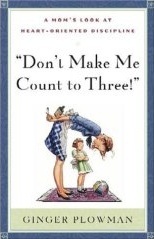 I was searching the internet about discipline and I was led to this book recommended by a Christian homeschooling mom, “Don’t make me count to three” by Ginger Plowman, an easy book to read yet so much wisdom. Thank God, it is also available in our public library. It pricks my heart when I read this quote, “A parent who spanks a child in anger is sinning against God and sinning against their child.” As much as I desire my child to grow up with godly character, I am the one in need to grow in my own character too. Now I see discipline with a different perspective – it is more than controlling the outward behaviour of a child but importantly to get to the child’s heart. When our children think right, they will act right instead of fear of punishment. Our goal at this stage of her development is to train her to obey as she is still learning about the world she is living in, immature and not ready to make independent decision, and to teach her the right behaviour and heart attitude to have. Training a child in righteousness is a process and we need a lot of perseverance, patience, love and God’s wisdom to teach her right. Mom : Dot, you cannot beat Papa. It is not correct. What should you say? Dot : Papa, sorry beat papa. Mom : Dot, why did mommy punish you? Dot : Because Dot so naughty. Mom: Mommy punish Dot because I love you and I want you to be obedient. This conversation does not mean the end of her poor behaviour. She still misbehaves. We will just keep training her the right behaviour and attitude to have until she gets it. Though Dot is only two years old, I still ask her to forgive me when I discipline her out of anger. For newbie mom like me, I am very grateful that at least some of the clouds over my head are cleared after reading her book on how to train our children with love. At the very least, it saves me from being her worst mom! Thanks so much for this post, the verse just jumped at me and I know that’s exactly what I need to ‘hear’ now. My boy’s at a stage where my patience is often tested, but thanks for that very timely reminder. Now, I need to go hunt for the book. I’m reading a book on Michele Bora on Ain’t Misbehavin, which is also on the topic of disciplining our children. Will share what I learn from the book. Like you, sometimes I get so exasperated and don’t know what to do when Sophie misbehaves. It rally gets to me especially if I’ve had a bad day at work and have to come home and deal with bad behavior. Pray that God gives us the wisdom as moms to know how to bring them up in His ways. I agree with you Dee – the heart is an important aspect, and we often overlook it because it’s easier to focus on the behaviour. When Vear was going through her terrible-twos phase, I found this book “The New Strong-willed Child” by James Dobson helpful – it advocates maintaining a balance of love and discipline, and also teaches about how children actually feel safe with a clear and consistent set of rules / boundaries, and how to differentiate between outright defiance and non-defiant (childish) acts. June, thanks for the link-up!